Early Morning : Juice and plenty of water or milk. Alia starts her day with water. She will drink two or three glasses of water before going in either for milk or juice. Morning : Light Breakfast: Alia starts her morning with with a light breakfast which usually contains Poha, oatmeal, green salads and a selection of early morning fruits. She might also go for cornflakes (not the chocolate ones). Midday snacks : Alia eats before she gets hungry.This is around 12 noon and she will usually have a vegetable juice and fruits again. 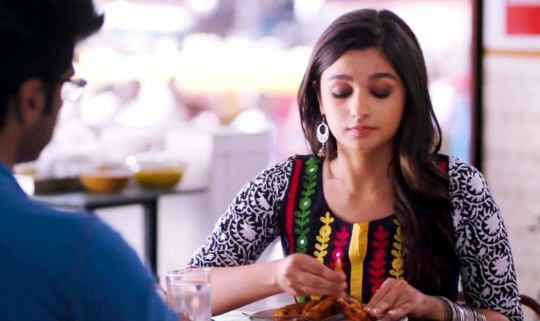 Lunch Time : Alia generally goes for an early lunch and she is fond of Pasta. This is the time you might also see her gorging on a mean sandwich too. Sometimes she goes for Dal-Roti-chicken menu too. No rice is served to her at lunch ever. Snacking time : She prefers all kinds of snacks in limited quantities and this is also the time when she will gulp down a few cups of coffee. Pre-dinner : Dinner is early and this is the time again when Alia will have a huge bowl of salad. Dinner : Dinner is always light and might consist of seared chicken breast pieces or paneer. However, we got to know that she has started avoiding roti or rice during dinner and perhaps would like some tossed veggies with herbs.